Cut the cartonila into a rectangle 20 x 10 inches in size. Draw a line in the center. Attach the baking paper to the cartolina, making sure to cover all sides. Fold one side of the cartolina into the center, using the line as guide. Fold other end over to make a cone. Trim base so cone will stand straight. Seal with tape to keep in place. Set aside. With knife, chop the semisweet baking chocolate into small pieces. Place in a heatproof bowl. Heat cream in a saucepan, stirring occasionally, until small bubbles begin to appear. Remove cream from heat and pour it on the pieces of baking chocolate. Cover bowl for about 1 minute to allow chocolate to melt. Stir cream and chocolate together until smooth. Blend chocolate chips, nut and marshmallow into the chocolate mixture. Stand the pointed end of the cone in side the tall glass(such as a pilsen glass or parfait glass). Spoon the chocolate mixture into the cone. Chill in refrigerator until chocolate hardens, about 4 hours. 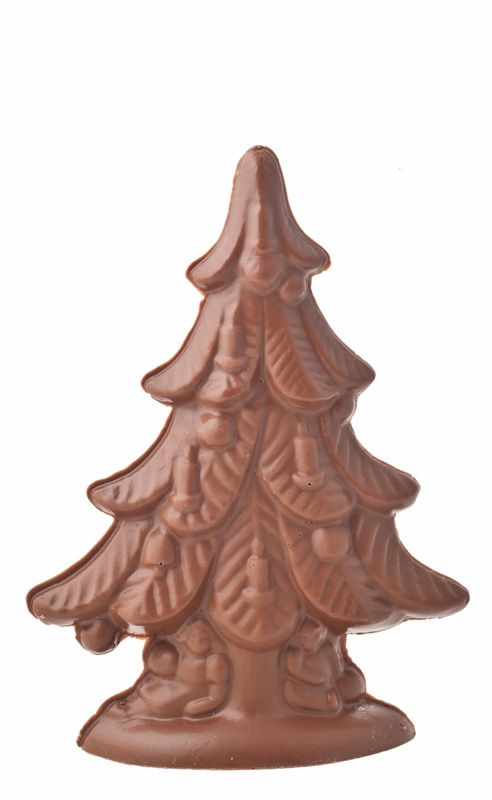 Carefully unwrap the chocolate tree from the cartonlina and baking paper. Make the tree stand on a serving dish. Decorate with stars, chocolate dragees or with any desired confectionery. Using melted chocolate as glue.